I am in Argentina, sitting in a round with a bunch of strangers, about to do a walking tour, and one of those revealing incidents happens. The guide asks what we are all doing in South America and most people in the group answer they're traveling in the region. 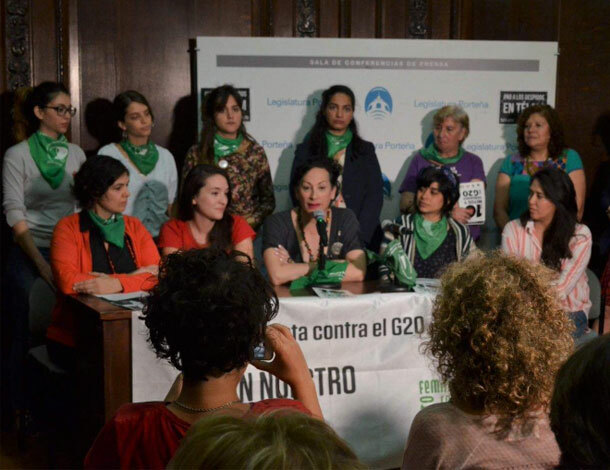 “I came to Buenos Aires to protest against the G20”, I explain. G20 is a forum that brings together heads of the richest states and international financial institutions to deliberate on economic policy for the rest of the world, with little to no voice for other countries and civil society. One of the tourists replies to me: “I hope you didn’t throw any rocks”. Well, not this time. I suspect many more people around us live in the distorted picture they get in the media: people protesting are merely trouble-makers shouting in the streets for no good reason. In truth, realities of resistance are spaces of connection and generosity, of listening and learning, of strategizing and seeking justice. In AWID we call them Feminist Realities. 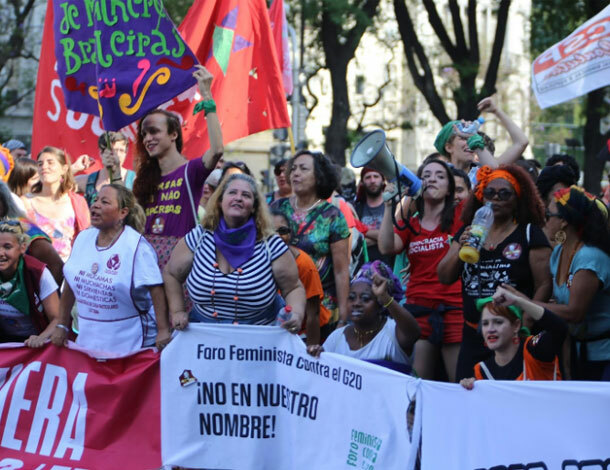 Generosity is precisely the word that comes to mind as I think of the Feminist Forum against the G20 which took place late November in Buenos Aires, Argentina. Generosity of knowledge and experience, of feminist transformative energy, of solidarity. Let me show you. We shared the fundamental understanding that the political and economic policies of privatization, austerity, and endless extraction of natural resources come at a terrible cost for human societies and for the environment. And, we shared a sense of urgency, knowing that change is possible, finding solutions in ancestral pasts, in our expertise and lived practices, and in our own imagination. To understand the significance of feminist mobilisation against the G20 we have to account for the depth of corporate capture of women's rights. The G20 brought us the W20, a formal process to influence the G20 to increase women’s participation in economies. Meanwhile Christine Lagarde, the Director of the International Monetary Fund (IMF) speaks of women’s economic empowerment. You could think there for a moment that the economy is working for women. But when people are forced out of their homes and ancestral territories, when women work under conditions of exploitation and violence, and evidence shows growing poverty and inequalities, we know very well it does not. G20, along with the IMF and the World Bank, are part of the neoliberal vehicle that runs down millions of people and drives environmental degradation. Women in the Global South pay the highest prices. 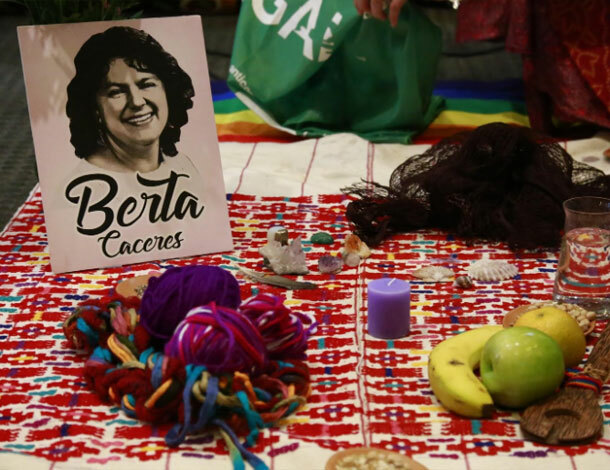 Berta Cáceres, Marielle Franco, and other sisters killed for resisting the injustices of patriarchy and capitalism, were there with us, present and loved. 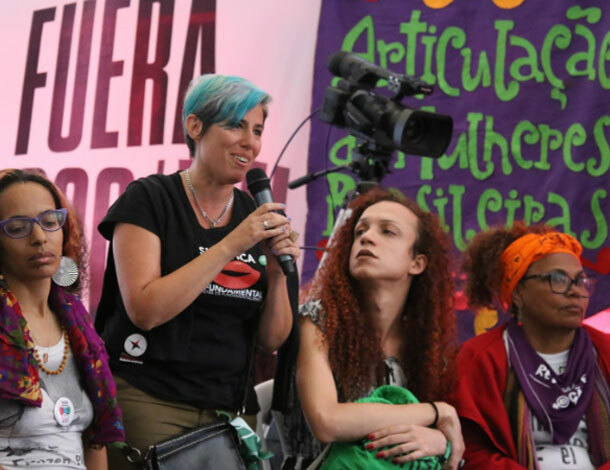 It is perhaps not accidental that the Feminist Forum against the G20 has coincided with the International Women Human Rights Defenders Day, as we remember and honor feminist and activists who are no longer with us - many of them killed for resisting abuses by corporations and the state. The Feminist Forum against the G20 kicked off with seminars and popular education, continued with popular feminist tribunals and concluded with a street march. In the Feminist School of Economics, we have analyzed how the global economy works and how corporate power and corporate interests infringe on public life. We have de-mystified illicit financial flows and reflected on their connection to our everyday life, discussed digital economies and access to public services, and exchanged examples and experiences of feminist resistance to economic, social and political injustices. Economists and policy-makers speak of the economy as a neutral objective science reserved for experts. When we claim economic knowledge and comprehension, we understand how far it is from neutrality. Not only is the field of economics profoundly ideological and political; the ideologies driving it are patriarchal, capitalist and neo-colonial. It is not science nor destiny that the global economy serves multinational corporations and the elite rather than the wellbeing of the people and the sustainability of our environment. Women’s mere participation in this economic system is not the answer; a feminist transformation of the system is. The popular ethical feminist tribunal, as part of the Feminist Forum, brought powerful testimonies in three sessions: advances of fascism in Latin America; defense of lands and territories and the struggle against extractivism; and, women and sexual dissidents in migration. 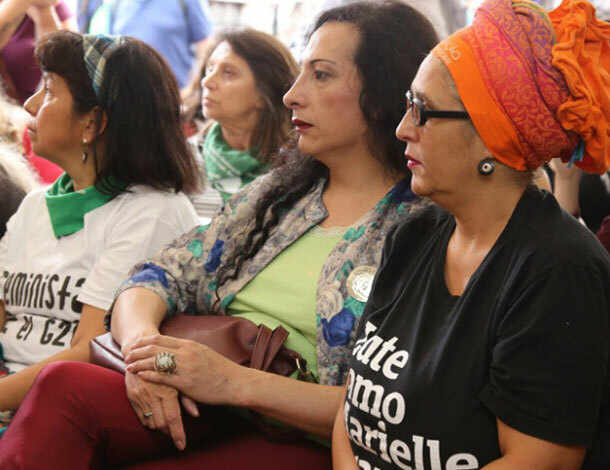 One after the other, women took the stage to denounce the crimes of international financial institutions like the IMF and the governments complicit in spreading neoliberalism and intensifying racism and sexism. An audience of 250 listened to every word. A panel of jurors listened and issued the sentence the following day, read out during the mass protest against the G20. This was the first time I experienced such a form of popular ethical recognition and justice. I didn’t expect to be as moved, and I felt humbled and reminded of the power we have, as communities, to seek and grant recognition to each other. Particularly when official state and judicial institutions are not equipped to sufficiently recognize structural and historical forms of violence, or when they themselves are among the perpetrators. The week of feminist mobilisation against the G20 ended with a mass protest, where hundreds of thousands marched under banners of numerous diverse groups, social movements and trade unions. The disastrous state of our world is not a surprising accident nor a by-product, but a direct result of profit-driven and greed (and fossil) fueled agendas. With the global financial crisis, the spread of right-wing politics and fascisms, the unfettered corporate power, and the looming climate catastrophe, the G20 Summit is certain to be met with popular resistance wherever it goes. You can count on the feminists to be there. Initiatives like W20 and promises of women’s participation in the economy are not enough to make us forget how inherently exploitative and unjust this economy is, and how deeply it needs to be challenged. 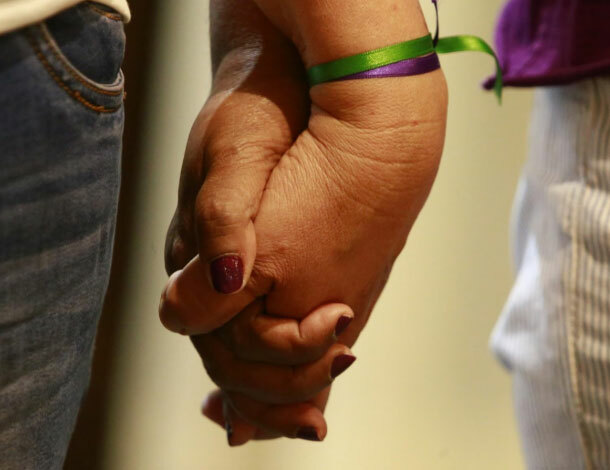 These Feminist Realities - the powerful spaces of resistance, solidarity and justice - are not isolated. There is a thread connecting us across time and place. Coming together to discuss the worlds we are fighting for, we are in fact already building them; we get a glimpse and a taste of them, and we get energy and inspiration. We carry this inspiration forward, to our everyday lives, to our future struggles, to our encounters with each other. This is our power in action. This is why those of us outside of the Latin American region felt at home in this feminist reality in Buenos Aires, understanding each other perfectly across languages and national boundaries (the pains of getting a visa is a whole different story, as we continue to struggle against restrictive regimes). This is why, every four years, we organize the AWID International Forum. These precious days together, and the long collective preparatory processes leading to them, remind us - in the body, in the mind, in the spirit - that feminist realities are real as much as they are magic. This is what the Feminist Forum against the G20 reminded us, and generously.